tablet coating: hypromellose, titanium dioxide, propylene glycol, color blue (brilliant blue). Trifluoperazine is one of the phenothiazine class of compounds and as such has many pharmacodynamic effects which relate to its therapeutic actions and side effects. The most notable action of phenothiazines is antagonism at dopamine receptors in the CNS. It is hypothesised that this action in the limbic system and associated areas of cerebral cortex is the basis of the antipsychotic action of phenothiazines, whilst in the medullary chemoreceptor trigger zone it appears to be responsible for the antiemetic effect of these agents. In addition, dopamine antagonism in the basal ganglia appears to be involved in some of the extrapyramidal side-effects of phenothiazines, whilst blockage of the dopaminergic inhibition of prolactin release from the anterior pituitary gland is thought to lead to hyperprolactinaemia. Other central actions of phenothiazines include sedation and inhibition of the function of the hypothalmic heat regulatory centre. Phenothiazines also lower the seizure threshold. Central actions of phenothiazines also affect the cardiovascular system, as does their antagonism of peripheral α – adrenergic receptors, which can cause hypotension. Phenothiazines also have anti – muscarinic activity which causes certain side effects. Trifluoperazine is one of the piperazine sub–class of phenothiazine drugs whose members have fewer sedative, antimuscarinic and hypotensive side – effects but more extrapyramidal side effects than other types of phenothiazines. Trifluoperazine hydrochloride is readily absorbed from the gastrointestinal tract following oral doses; peak plasma concentrations are attained 1.5 to 6 hours after ingestion and bioavailability is subject to interindividual variation. It is highly bound to plasma proteins – more than 99 %. The elimination of trifluoperazine is multiphasic and the terminal half-life is about 22 hours. It is also extensively metabolised in the liver and is excreted in the urine and faeces in the form of numerous active and inactive metabolite (less than 1 %). Together with its metabolites, it crosses the placental barrier and is is distributed into breast milk. Schizophrenia and other psychoses, short-term adjunctive management of psychomotor agitation, excitement and violent or dangerously impulsive behaviour. Short-term adjunctive management of severe anxiety. Schizophrenia and other psychoses, short-term adjunctive management of psychomotor agitation, excitement, and violent or dangerously impulsive behaviour:Adult and child over 12 years: initially 5 mg twice daily, increased by 5 mg daily after 1 week, then at intervals of 3 days, according to the response. Adult and child over 12 years: 2–4 mg daily in divided doses, increased if necessary to 6 mg daily. Child 3–5 years up to 1 mg daily in divided doses. Child 6–12 years up to 4 mg daily in divided doses. The same dose is indicated in the symptomatic treatment of nausea and vomiting. Elderly reduce initial dose by at least half. Extrapyramidal symptoms are the most troublesome, especially at doses exceeding 6 mg daily. They occur most frequently with trifluoperazine. They are easy to recognise but cannot be predicted accurately because they depend on the dose, the type of drug, and on individual susceptibility. tardive dyskinesia (rhythmic, involuntary movements of tongue, face, and jaw), which usually develops on long-term therapy or with high dosage, but it may develop on short-term treatment with low doses— short-lived tardive dyskinesia may occur after withdrawal of the drug. Hypotension and interference with temperature regulation are dose-related side-effects and are liable to cause dangerous falls and hypothermia or hyperthermia in the elderly. Neuroleptic malignant syndrome (hyperthermia, fluctuating level of consciousness, muscle rigidity, and autonomic dysfunction with pallor, tachycardia, labile blood pressure, sweating, and urinary incontinence) is a rare but potentially fatal side-effect of some drugs. Cardiovascular symptoms (such as hypotension, tachycardia, and arrhythmias); ECG changes (cases of sudden death have occurred); endocrine effects such as menstrual disturbances, galactorrhoea, gynaecomastia, impotence, and weight gain; blood dyscrasias (such as agranulocytosis and leucopenia); photosensitisation, and rashes, and jaundice (including cholestatic); corneal and lens opacities, and purplish pigmentation of the skin, cornea, conjunctiva, and retina. Antipsychotics should be used with caution in patients with hepatic impairment, renal impairment, cardiovascular disease, including patients with cardiac arrhythmia, stenocardia. Parkinson’s disease (may be exacerbated by antipsychotics), epilepsy (and conditions predisposing to epilepsy), myasthenia gravis,benign prostate hyperplasia or a susceptibility to angle-closure glaucoma, hypersensitive to other phenothiazines. The balance of risks and benefit should be considered before prescribing antipsychotic drugs for elderly patients. In elderly patients with dementia, antipsychotic drugs are associated with a small increased risk of mortality and an increased risk of stroke or transient ischaemic attack. Furthermore, elderly patients are particularly susceptible to postural hypotension and to hyper- and hypothermia in hot or cold weather. The balance of risks and benefit should be considered before prescribing Triftazine in patinets with pathological changes in the blood picture , alcohol intoxication, Reye’s syndrome, breast cancer, gastric ulcer and duodenal ulcer, urinary retention, chronic respiratory diseases (especially in children). Extrapyramidal symptoms are the most troublesome, especially at doses exceeding 6 mg daily. Such reactions may often be controlled by reducing the dosage or by stopping medication. In more severe dystonic reactions, an anticholinergic antiparkinsonism drug should be given. Trifluoperazine can disrupt the hypothalamic mechanism for temperature regulation. Therefore, patients should avoid exposure to extreme temperature variations to prevent hyperthermia or hypothermia. Nausea and vomiting as a sign of organic disease and overdoses of other drugs may be masked by the anti-emetic action of Triftazine. Neuroleptic malignant syndrome (NMS) can occur in patients receiving phenothiazines. NMS is characterized by hyperthermia, severe extrapyramidal dysfunction, alterations in consciousness, altered mental status, and autonomic instability (sinus tachycardia, low blood pressure or hypertension, diaphoresis). Increased serum creatine phosphokinase (CPK), acute renal failure, and leukocytosis also have occurred. The phenothiazine should be immediately discontinued and appropriate supportive therapy initiated as soon as symptoms of NMS are discovered. Necessary to avoid the simultaneous use of Triftazine with adsorbent antidiarrheals.As photosensitisation may occur with higher dosages, patients should avoid direct sunlight. Alcoholism is a relative contraindication to phenothiazine therapy. Patients with rare hereditary problems of galactose intolerance, Lapp lactose deficiency or glucose-galactose malabsorption should not take this medicine, because 1 tablet of Triftazine content 29.35 mg lactose monohydrate. During treatment with Triftazine patients should avoid activities that require high concentration and rapid psychomotor reactions. 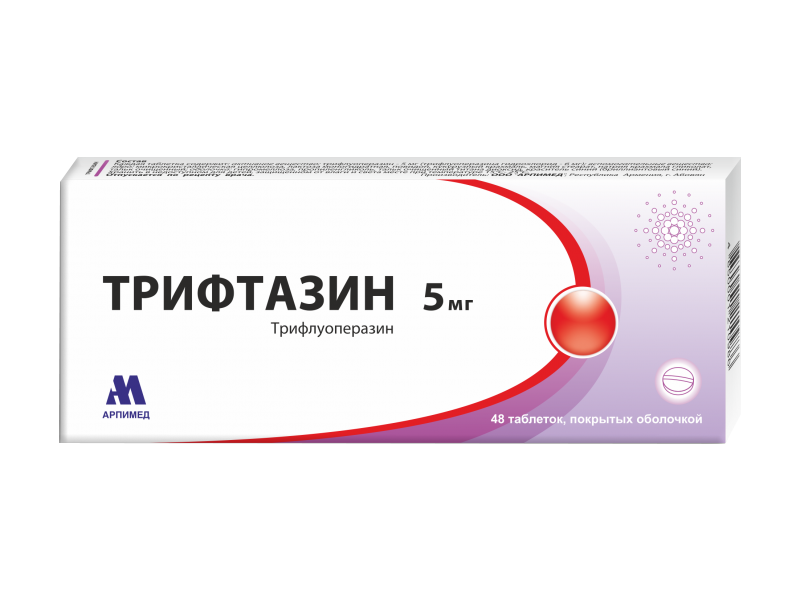 Triftazine is contraindicated for use during pregnancy and breastfeeding. – Hypersensitive to the active ingredient or related compounds or any of the excipients. Increased risk of toxicity with bone marrow suppression drugs . ACE Inhibitors: enhanced hypotensive effect when antipsychotics given with ACE inhibitors. Adrenergic Neuron Blockers: enhanced hypotensive effect when phenothiazines given with adrenergic neurone blockers. Adsorbents: absorption of phenothiazines possibly reduced by kaolin. Alcohol: increased sedative effect when antipsychotics given with ethanol and drugs containing ethanol, may cause respiratory depression. Alpha-blockers: enhanced hypotensive effect when antipsychotics given with alpha-blockers. Anaesthetics, General: enhanced hypotensive effect when antipsychotics given with general anaesthetics. Analgesics: enhanced hypotensive and sedative effects when antipsychotics given with opioid analgesics. Angiotensin-II Receptor Antagonists: enhanced hypotensive effect when antipsychotics given with angiotensin-II receptor antagonists. Antacids: absorption of phenothiazines and sulpiride reduced by antacids. Anti-arrhythmics: increased risk of ventricular arrhythmias when antipsychotics that prolong the QT interval given with anti-arrhythmics that prolong the QT interval. Antibacterials: increased risk of ventricular arrhythmias when haloperidol, phenothiazines or zuclopenthixol given with moxifloxacin—avoid concomitant use. Antidepressants: antipsychotics increase plasma concentration of tricyclics—possibly increased risk of ventricular arrhythmias; increased risk of antimuscarinic side-effects when phenothiazines given with tricyclics. Antidiabetics: phenothiazines possibly antagonise hypoglycaemic effect of sulphonylureas. Antiepileptics: antipsychotics antagonise anticonvulsant effect of carbamazepine, ethosuximide, oxcarbazepine, phenytoin, primidone and valproate (convulsive threshold lowered). Antimuscarinics: plasma concentration of phenothiazines reduced by antimuscarinics, but risk of antimuscarinic sideeffects increased. Antipsychotics: increased risk of ventricular arrhythmias when pimozide given with phenothiazines— avoid concomitant use. Antivirals: plasma concentration of antipsychotics possibly increased by ritonavir. Anxiolytics and Hypnotics: increased sedative effect when antipsychotics given with anxiolytics and hypnotics. Atomoxetine: increased risk of ventricular arrhythmias when antipsychotics that prolong the QT interval given with atomoxetine . Barbiturates: antipsychotics antagonise anticonvulsant effect of barbiturates (convulsive threshold lowered). Beta-blockers: enhanced hypotensive effect when phenothiazines given with beta-blockers; increased risk of ventricular arrhythmias when amisulpride, phenothiazines, pimozide, sertindole or sulpiride given with sotalol. Calcium-channel Blockers: enhanced hypotensive effect when antipsychotics given with calciumchannel blockers. Clonidine: enhanced hypotensive effect when phenothiazines given with clonidine. Diazoxide: enhanced hypotensive effect when phenothiazines given with diazoxide . Diuretics: enhanced hypotensive effect when phenothiazines given with diuretics. Dopaminergics: increased risk of extrapyramidal sideeffects when antipsychotics given with amantadine; antipsychotics antagonise effects of apomorphine, levodopa and pergolide; antipsychotics antagonise hypoprolactinaemic and antiparkinsonian effects of bromocriptine and cabergoline; avoidance of antipsychotics advised by manufacturer of pramipexole, ropinirole and rotigotine (antagonism of effect) . Lithium: increased risk of extrapyramidal side-effects and possibly neurotoxicity when clozapine, flupentixol, haloperidol, phenothiazines or zuclopenthixol given with lithium. Memantine: effects of antipsychotics possibly reduced by memantine. Methyldopa: enhanced hypotensive effect when antipsychotics given with methyldopa (also increased risk of extrapyramidal effects). Metoclopramide: increased risk of extrapyramidal side-effects when antipsychotics given with metoclopramide. Moxonidine: enhanced hypotensive effect when phenothiazines given with moxonidine. Nitrates: enhanced hypotensive effect when phenothiazines given with nitrates. Pentamidine Isetionate: increased risk of ventricular arrhythmias when phenothiazines given with pentamidine isetionate. Sibutramine: increased risk of CNS toxicity when antipsychotics given with sibutramine (manufacturer of sibutramine advises avoid concomitant use). Sodium Oxybate: antipsychotics possibly enhance effects of sodium oxybate. Sympathomimetics: antipsychotics antagonise hypertensive effect of sympathomimetics. Tetrabenazine: increased risk of extrapyramidal sideeffects when antipsychotics given with tetrabenazine. Ulcer-healing Drugs: effects of antipsychotics, chlorpromazine and clozapine possibly enhanced by cimetidine. Vasodilator Antihypertensives: enhanced hypotensive effect when phenothiazines given with hydralazine, minoxidil or sodium nitroprusside. When phenothiazines given with tricyclic antidepressants, maprotiline or monoamine oxidase (MAO) inhibitors the risk of neuroleptic malignant syndrome (NMS) may be increased. 2 blister packets with 24 tablets in the cardboard box.